A decorative copper wire dragonfly with Czech glass, fluorite, agate and blue kyanite semi-precious gem stone beads. Inspired by a hazy summer’s day, picnicking by a river watching the dragonflies play over the water. This little piece of wire wall art is suitable for both inside the home and out in the garden. Inspired by the common blue damselfly (Enallagma cyathigerum), a species of dragonfly found all over the British Isles, with striking blue, black and azure colours. Beads: Czech glass, rainbow fluorite, labradorite, agate and blue kyanite. Metal: Solid copper wire with a patina finish polished to reveal the warm coppery tones beneath. The copper has been sealed with a gloss varnish. Width Approx: 12cm / 4.7 inches. A decorative copper wire dragonfly with agate, carnelian, moonstone, honey quartz and glass beads. Inspired by the striking colours found in the British ‘Scarlet Darter Dragonfly’, this distinct species can often be seen near shallow and still waters. This little piece of wire wall art is suitable for both inside the home and out in the garden. The colour palette is rich and vibrant with yellows, oranges, reds and browns set against the contrasting deep tones of polished copper. 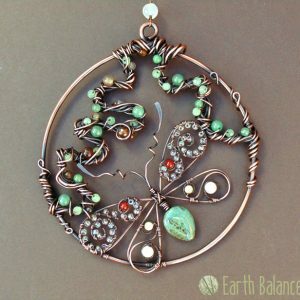 A decorative copper wire dragonfly suncatcher with agate, aventurine, quartz and glass beads. Inspired by the striking colours found in the British ‘Beautiful Demoiselle Dragonfly’, this distinct species with metallic blue and green coloured wings. These winged beauties, flutter around streams and rivers with a similar flight path as butterflies. 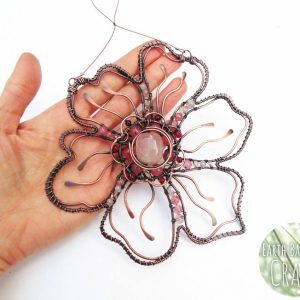 Designer Nicola loves to bring nature to life through wire art, and her love of wild life grows every day. Whether for hanging in the home as a window decoration or out in the garden this pretty dragonfly would make even a dreary day feel colourful and vibrant.